Correction is still taking place. New target is in the area formed near level of 78.6% (extension from descending movement over the period from October 25th – November 4th). Possibly, Euro may break local minimum during the day. 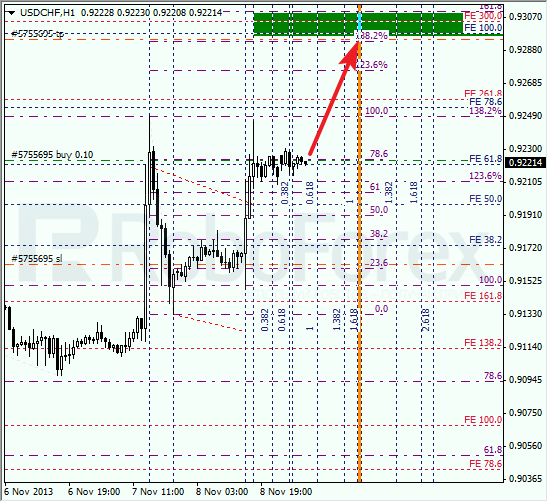 As we can see at the H1 chart, there are four fibo-level inside target area. According to the analysis of the temporary fibo-zones, pair may reach its predicted levels during Monday and later start new correction from lower levels. Franc is also being corrected. Probably, bulls may reach new maximum during the day and then continue pushing price upwards. Upper target area is formed by three fibo-levels. During local correction, I opened short-term buy order. 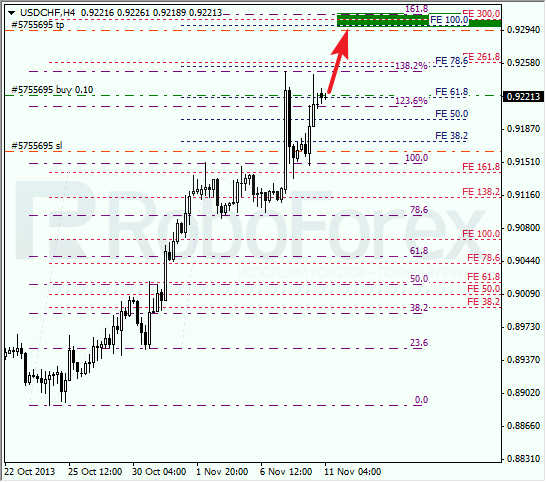 At the H1 chart, we can see one more fibo-level, 138.2%, inside target area. According to the analysis of the temporary fibo-zones, pair may reach its targets during the day. I’ll move stop into the black as soon as price breaks maximum.